VERY unique and thoughtful design built with a lot of love, creativity and attention to detail. After 4 years living in and building tiny homes in the Hudson Valley, we designed this structure to be a mobile, comfortable, 4-season, completely off-grid tiny house. In 2017 we framed, insulated, roofed and sided it on a 24’ custom trailer with the help of 5 high school students as part of a paid summer vocational training program called Tool UP!. We are now selling this structure as a “shell,” meaning it does not have utilities or interior finishes. This is a perfect opportunity for someone to customize this rare building into their own dream tiny home, office, writing cabin, art studio, mobile business, or whatever you can imagine it to be. The design of this structure offers functional interior living space, high insulation value, compliance with DOT interstate size restrictions, off-grid capabilities and a highly original appearance. Additional design highlights: RARE SIDING - Stunning burnt “shou-sugi-ban” live-edge slab siding is installed vertical “board-on-board,” delivering a beautiful, distinct look while protecting the building from the harsh northeastern elements. METAL ROOF - Black corrugated metal roof accents the sleek, rustic siding and offers superior durability and weatherproofing. LOCAL LUMBER - Framed and sided entirely using locally milled rough-sawn lumber. WELL INSULATED - Insulated with Hunter XCI foil rigid foam panels (6.5R/in). Full 4’x8’ sheets are inlaid under trailer cross members and over studs in the walls to minimize thermal bridging. GLASS DOOR - Double glazed, full-glass front keyed-entry door with brushed-bronze hardware. UNIQUE SHAPE - Angled walls overhang both ends of the trailer by 4ft to increase the interior loft space while also protecting the house and trailer. DORMER - A wide dormer stretches across the back to maximize loft headspace. BIG LOFT - The long 15’ loft allows for a full bedroom and utility closet “upstairs”. NEW TRAILER - Constructed on a brand new, custom-built trailer with drop axles which provide an additional 4” of interior height while staying within the DOT 13’-6” requirement. ***All stages of construction have been meticulously documented and can be shared upon request. More details about this structure are available through this PDF. ASKING PRICE: $45K (consider this: we priced out that it would only cost an additional $15K for a DIY’er to turn this structure into a completely finished, off-grid living space with a full loft bedroom, eat-in kitchen, shower/bathroom, living room and guest-bed loft. 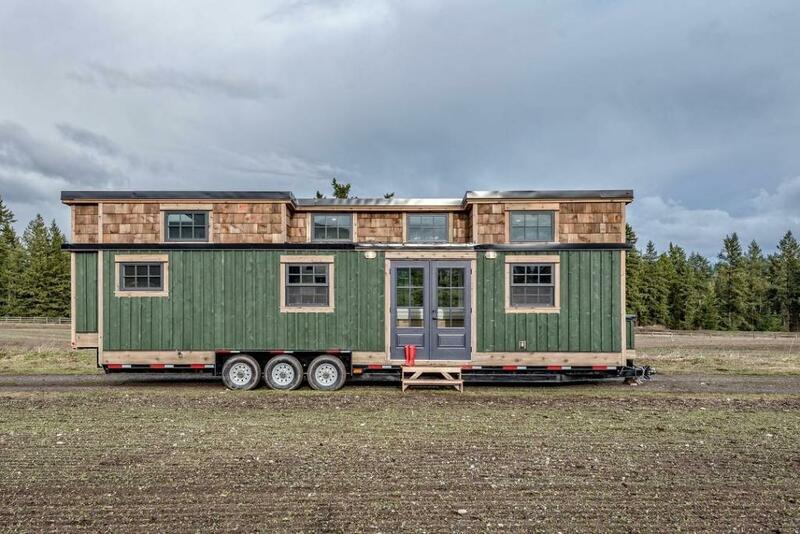 That’s $60K for a beautiful, custom-built, move-in ready, 4-season, mobile tiny house which is an awesome deal.) Included with the sale of this SHELL: -Title to the trailer -TWO sets of keys! -Potential delivery (depending on mileage / location) -Gorgeous ash hardwood floorboards we milled specifically for this project from local lumber (uninstalled but enough to do the interior floor and possibly the loft) -Digital 3d model and Original Floor plan design for off-grid tiny house This is a must see! Serious buyers only! Contact us today for a showing or for additional information. 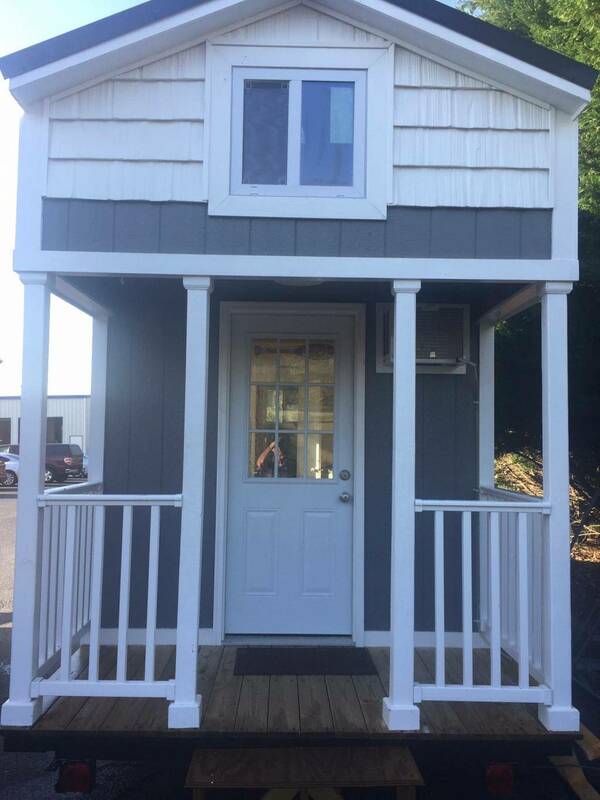 Beautiful New Tiny House For Sale Free delivery available, currently located in Utah. 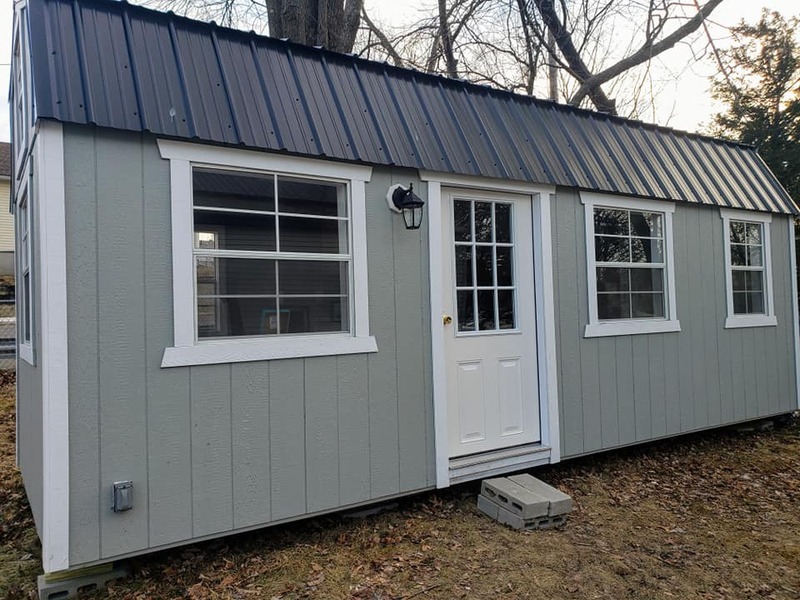 Built in 2018 this brand new tiny house features board and batten siding, shiplap interior cladding, maple butcher block countertop, 2 large lofts, steps with storage, full size tub, tankless water heater, tempered glass, low e windows, mini split heating a cooling system, washer and dryer, full size closet and so much more. 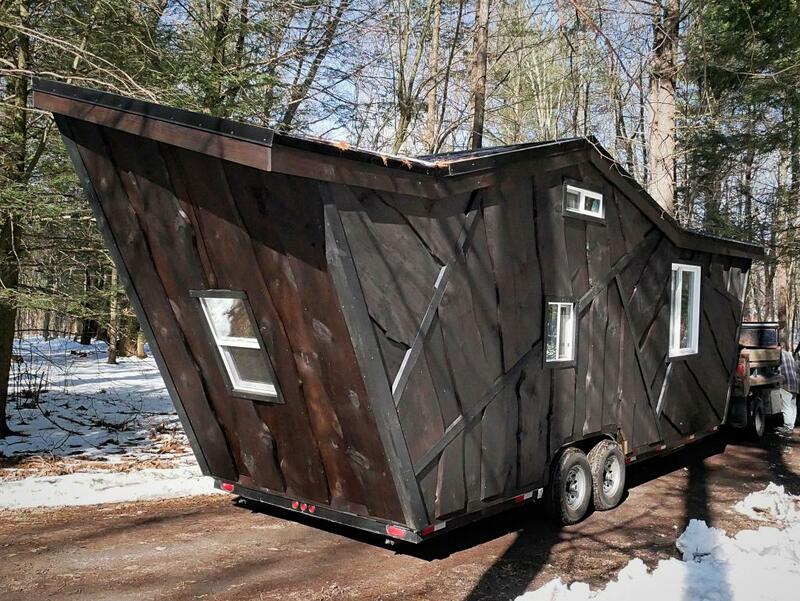 It’s built on a tiny house foundation trailer with leveling jacks at all 4 corners. This tiny house was built with steel framing which reduces weight, is 25 times stronger than wood and will not catch fire. The steel roof will last a lifetime and reflect sunlight to reduce heat transfer and lower cooling costs. Waterproof luxury vinyl flooring looks like real wood but is easier to clean and less worry. 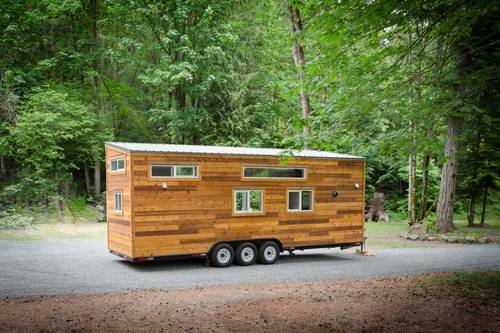 This tiny house is road legal and easy to move and set up. Can be pulled with a ¾ ton truck, brakes at all 3 axles make it easy to stop when towing. We built this unit and offer a 1 year warranty and can do modifications, alterations, or whatever you need to make it perfect for you. Email me to ask any questions. 2016 custom-built tiny house with RVIA certification. Minimalist design with clean and modern lines. Comfortably sleep two on a queen bed. Panoramic windows on one side as well as windows in the bathroom, above the seating bench and near the bed allow plenty of light to fill the bright white pine interior. The amenities included make this your home away from home: electric wall heater, hot and cold water, and a full size shower. Great option for personal cabin on scenic property. 20 ft (L) x 8-6ft (W) x 11-1ft (H) - Total height off ground: 13-5 ft - Built on a deck-over trailer - Dual 7,000 lb axles - Total weight is approximately 10,000 lbs - Rolled rubber membrane roofing - Exterior covered with stained white pine - Built to enjoy in all seasons - On-board hot and cold water plumbing system - 200 gal tank for freshwater - 200 gal tank for waste water - Bathroom has space for a dry-flush toilet - Full shower - Electric in-wall heater with Nest thermostat control - Oak hardwood flooring - RVIA certified *Buyer must arrange transport* No seller financing. Serious inquiries only. Cashiers check or bank wires only for final transaction. Schedule a showing today! On and off grid capability. 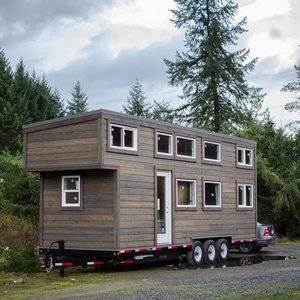 Tiny Home on wheels 160 sqf on ground floor and 80 sqf loft. Located in Central Florida but on wheels so home is able to be pulled anywhere. Accepting offers. Great home and/or investment to put on land for AIRBNB. Potential cash flow vacation property in growing area 65 min from Seattle. Perfect Airbnb or Hip Camp rental Great home office or seasonal storefront Perfect artist gallery Or possibly a yoga, meditation, spa retreat? Fantastic beachfront neighbors across the street Salt water is just a few minutes walk away Small quiet town at the center of all of the best activities the Pacific Northwest has to offer. 1.7 acres of sunny open knoll, ready to build 200 square foot solar powered recreational cabin shell. 1.9 kilowatts Well being drilled soon. Price $85,000 cash $95,000 owc with 35k dn 8% int $440 mo. Location- On a coastal loop near Allyn Wa. Drive 30 minutes north to catch the foot ferry to Seattle. Drive 30 minutes east to get to Tacoma. Drive 45 minutes south to get to Olympia. Drive 45 minutes west to get to the rain forest. This property is at the center of it all. Get to downtown Seattle faster than someone from Redmond can! Property- No HOA. Underground utilities. Wide open sunny grassy knoll. (Most neighbors live in perpetual shade from 150' tall cedars) Neighbors- The real unspoken blessing of the property is the good people in the neighborhood that range from retired architects, teachers and engineers to a permaculture camp, welder/machinist and seasonal vacationers. This is a more mature neighborhood that is very welcoming if you are respectful. Security- Do you have a Plan B location? Most major cities are a political powder keg and vulnerable to natural disaster or attack. The property makes its own power and there is plenty of room for gardens. We are more than 100' above the ocean in case of tsunami. Great neighbors too! Future growth/ property values- Seattle is full and there is a movement of people to the peninsula. A recent highway widening was just completed in Belfair. The long term trend is property appreciation. The Bremerton fast ferry can move you to Seattle in style and quick. Why drive in gridlock? FAQ- Does is have a bathroom or kitchen? No it's a shell. You decorate it how you like. Is there a septic system? No not yet. You would need to site your house first. 24' luxury tiny house Dimensions 24' x 8.5' x 13.5' 268 sq ft plus sleeping loft NOAH certified Haier fridge and freezer Haier washer and dryer combo Summit appliances dishwasher Summit appliances 4 burner gas cooktop and stove Summit appliances range hood All appliances are stainless steel Raini 9.6 gpm tankless gas waterheater Custom tile shower Solid oak butcher block countertops custom solid maple cabinets with soft close. Beautiful solid oak flooring Cedar lap siding Air circulation system Mini split for heat and air conditioning Toe kick heater in bathroom Cedar bolt on deck Two 40lbs propane tanks All LED lighting 50 amp rv electrical hookup Cable tv Choose between composting toilet or flushing toilet Milgard tempered glass windows Aluminum shingles roofing Spray foam insulation While building this stunning tiny house money and materials were not spared, many countless hours and months were spent trying to build the most quality, livable and beautiful tiny house on the market. If you are looking for a energy efficient with the highest end of materials this is the one for you!! Thanks for looking! This is a gorgeous, superb quality tiny house that feels more like a tiny mansion. Fully equipped and smart home enabled. Features include: •Brand new and one of a kind, build just finished in September. •Spacious, ~333 square feet. •Two large lofts, big enough for up to queen size beds in each. •28’ long (31’ with hitch), 8.5’ wide, 13.5’ high. •High ceiling over living room that makes the whole house feel even bigger. •Bathroom with dual flush toilet and 36” shower. •Front and back doors with porch lights. •Foyer between front door, living room and bathroom (separable by pocket doors). •Full kitchen with beautiful hardwood (hickory) cabinets, drawers, etc. •Large 24” kitchen sink with pull-out gooseneck faucet. •Small dishwasher. •Apartment size fridge. •Large dual microwave/convection oven (bakes faster than conventional ovens). •Two burner convection stovetop. •Large food-grade butcher block murphy table that can fold against wall. •Smart switches for lights and fans. •Ceiling fan over living room. •14 windows, lots of natural light. •Two french doors with internal blinds. •Warm and bright interior lighting. •Hookups for washer/dryer. •Propane on-demand water heater (everything else is electric). •Electric forced-air wall heater and smart thermostat. •Nest smart smoke and carbon monoxide detector. •Long roof dormer for a unique and elegant look. •Gorgeous sweeping ladders for easy access to both lofts. •High quality from reputable manufacturer (Tiny Mountain Houses), see listing on “Models in Stock” section. •Warranty extends to buyer through next September. •RVIA certified as an RV/travel trailer - legal anywhere you would be allowed to use/keep a travel trailer. Google Drive folder with photos, a video and info: https://drive.google.com/open?id=19i9-m9MOTk4GI_T3trrrx-p4FRQClSoJ Asking $89k, which is a good deal for the quality and value. Currently available for viewing in Roseville (outside of Sacramento), and we can help coordinate transportation to the buyer. Let us know if you have any questions, and thank you! This elegant tiny house design is one of a kind. 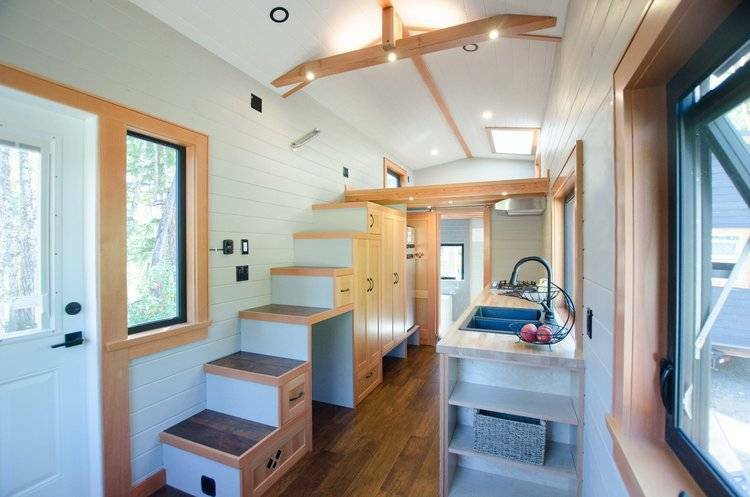 Inside and out, this tiny house on wheels has so many features to love. From the outside, you'll find grey siding with white trim, and Victorian details such as the octagon window, bay window in the front and scalloped shake roof details. Inside this tiny house on wheels, there is one bedroom and one bath in a space that feels much larger than its small footprint. The tiny kitchen has everything you need to make meal prep in style with a farmhouse sink, light grey kitchen cabinets, white countertops, oven, stove, lots of shelving and fridge. The kitchen even has a washing machine for laundry. White shiplap walls, crown moulding, and stairs that lead up to the sleeping loft are other details that further add to the appeal of this stunning tiny house design. The living area sits at the bay window and large windows, which offers views of your surroundings and the high ceilings further lend to the spacious feeling. There are plenty of windows in this tiny house design for lots of natural light. The stairs have storage underneath, and there is also a storage closet on the main floor, so there is lots of space to tuck your things away. The bathroom in this tiny house design doesn't disappoint either with white shiplap walls, a large sink with vanity, and plenty of storage. The best part of this bathroom might be the bathtub that makes the room feel luxurious. The upstairs sleeping loft has enough space for a double bed with windows and tiny shelves on either side of the bed. Not a detail has been missed in this tiny house design from the colors used to the lighting fixtures; this tiny house design is perfect for all your small house living needs. Whether that be for full-time living, vacation living, artist studio or backyard office. 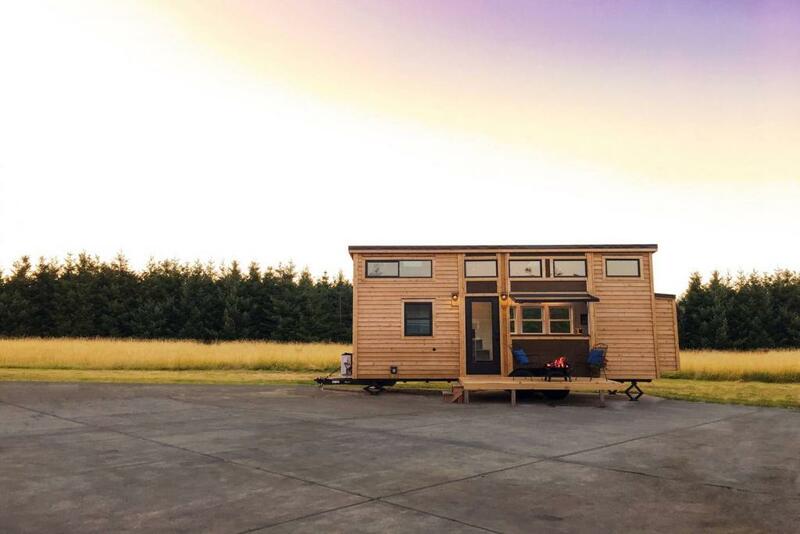 Those looking for a simple tiny house on wheels will love The Warbler, a 24-foot long tiny house from Rewild Tiny Homes. The Warbler is one of the company's most basic tiny house designs with a warm modern cabin feel. The exterior and the interior are both kept really simple with natural wood elements throughout. Multiple windows and skylights bring in a lot of light and create more of a spacious feel within the home too. While the wood flooring and tongue and groove panelling on the walls makes it cozy and comfortable. One of the other notable features of this floor plan is the bedroom on the main floor which is becoming more popular in tiny houses on wheels. There are still the loft spaces which could also be bedrooms, or they could serve as storage areas. Having a room on the main floor of the tiny house is also great for a home office for those who work from home. Or perhaps a kids room if the tiny house is for a family. The tiny house also includes LED lighting throughout for energy savings, and with all of the windows, this home may not even need lighting throughout the daytime. In the kitchen, you'll see a lot of food preparation space as well as a built-in induction cooktop on one of the countertops and a deep stainless steel sink on the other side. All of the cabinets are soft close drawers and cupboards, and they also included space for a mini fridge and an oven. For heating, there are electric wall-mounted electric heaters which keep the space warm even in colder weather. You will also notice the beautifully handcrafted staircase with tons of storage within it. There's even a little hole in one of the doors where a pet can enter through. It's always lovely when people include their pets in the design of their tiny house on wheels. In the bathroom, there is a great small sink and vanity that doesn't take up a lot of space, and, of course, a composting toilet which is very useful for off-grid living situations. Check out all of the photos of the Warbler and see if this simple style suits your taste. Here's a larger tiny house floor plan from Rewild Tiny Homes. 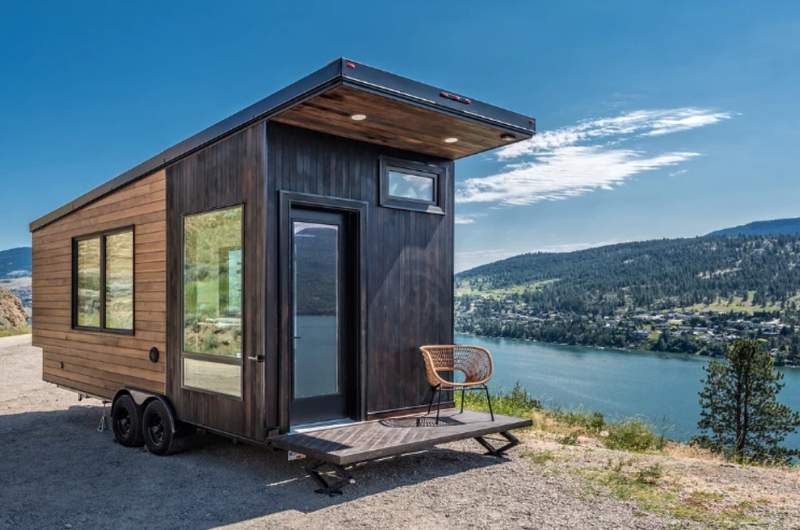 The Whiskey Jack is a stylish and modern 28-foot long tiny house on wheels home that brings a modern condo style together with a country cabin feel. The exterior of the home is done with custom milled cedar siding that was then stained to give it a rustic cabin look. The house is also built on a sturdy triple axle trailer which will be fully capable of handling the weight of this larger home. Inside, there is plenty of space for daily use, and the kitchen is one of the many highlights of this tiny house design. They went with light wood cabinets with modern stainless steel door pulls and quartz countertops. There is also a deep stainless steel sink as well as a built-in gas cooktop that would be fabulous to cook on. The glass tile in the kitchen adds to the modern appeal of the home, and the large stainless steel fridge is perfect for holding a good amount of food. There is no oven shown in the photos of the home, but a convection oven could be used for cooking and baking. Beside the kitchen, there is a great storage cabinet that would be great for food storage or storing any other items. Then, above the kitchen is a loft space with ladder access that would be great for a sleeping loft with a mattress. Windows make the loft feel more spacious thanks to the views and light they provide. There is also another loft of the opposite end of the home as well which would be best suited for storage or a smaller sleeping loft. The bathroom is tucked under the second loft and includes a great vanity with a large sink and a combo washer and dryer unit. This bathroom also has a composting toilet and a shower making a full bathroom. The centre space in the home would be the ideal place to set up a small sofa and a table with chairs for dining. There are so many ways the space could be set up to function well for the owners. How would you set up this space? 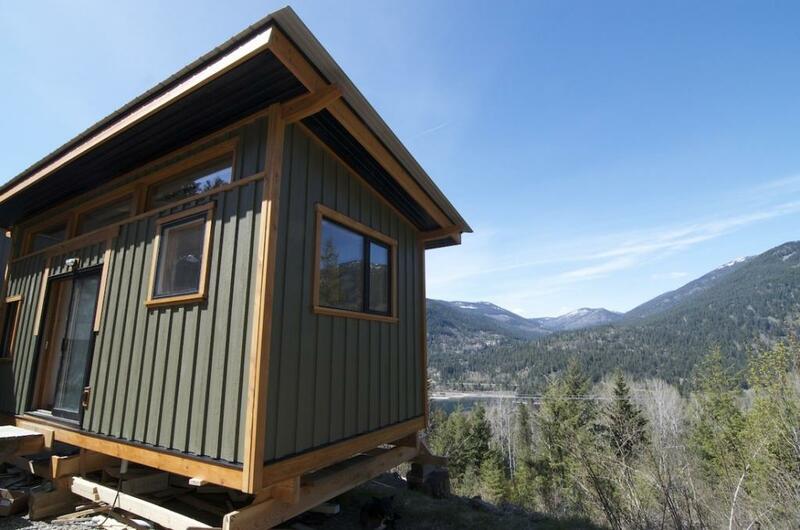 The Ptarmigan is another beautiful tiny house design created by Rewild Tiny Homes. 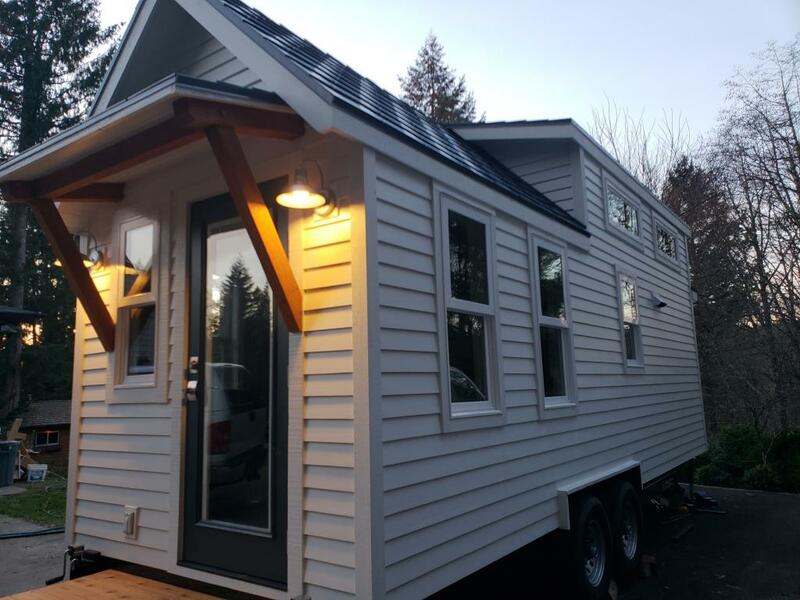 This one is a little bit different than their other tiny houses on wheels in that it is 12 feet wide instead of the typical 8.5 feet wide that you'll usually find with tiny houses built on trailers. 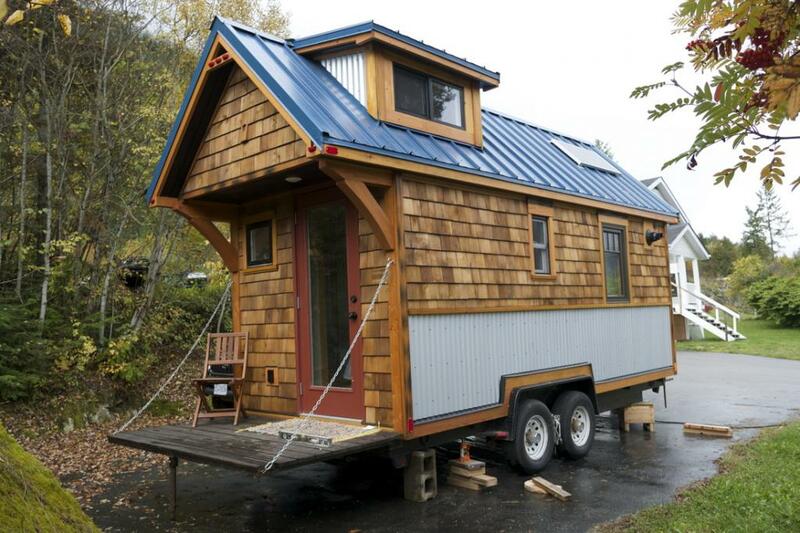 That width requirement is to make transporting easier for those who wish to travel with their tiny house more. However, if someone doesn't need to travel with their tiny house, and it remains parked, it can be a bit wider affording more space to work within the floor plan. This is a single level tiny home with no lofts, but because of the extra width, they didn't need to build lofts. The trailer the home is built on is a custom trailer has a capacity of 14,000 pounds, and it was built to measure 12 feet wide. It's noticeable how much space this extended width gives in the interior. It's not such a narrow space and so regular furniture and appliances would fit just fine. A home on wheels this size would be great for someone just starting out on a piece of land while a larger home is being built. Then, once the home is ready to live in, the tiny house can be moved to a different location on the land and used for other purposes. Inside the home, there are some other great features such as the custom birch cabinetry and the handcrafted finishes. The kitchen also has room for a combination washer and dryer, and there is tons of counter space to prepare meals. The bedroom includes a custom closet and a built-in end table with enough room for a queen sized bed. The tiny house has an ensuite bathroom with a flush toilet and an electric water heater tank. There are also safety handles in the bathroom for those who need them which shows that this could make an excellent home for an ageing parent or loved one. 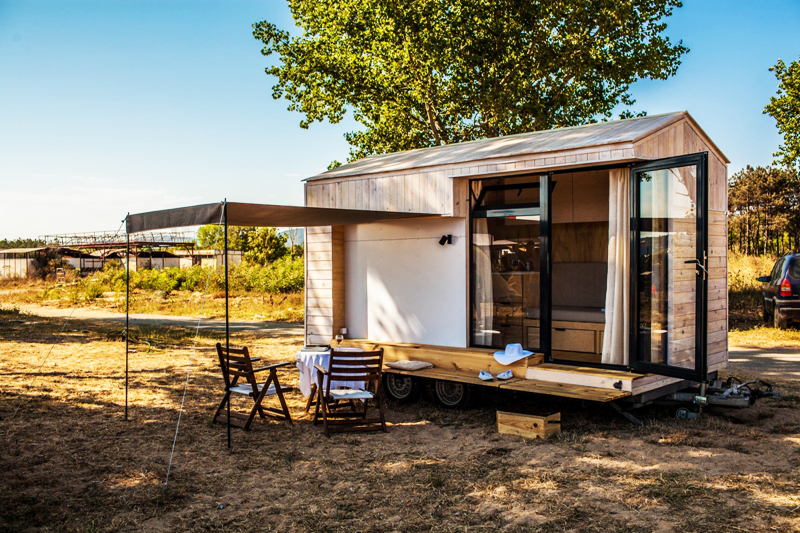 This tiny house design breaks the mould of what a tiny house on wheels can be which caters to a lot more people's needs and desires. When you're considering living an off-grid lifestyle, there are many things to get in order including your home set up. The Blue Heron tiny house design from Rewild Tiny Homes is an excellent example of a home that has many off-grid features. 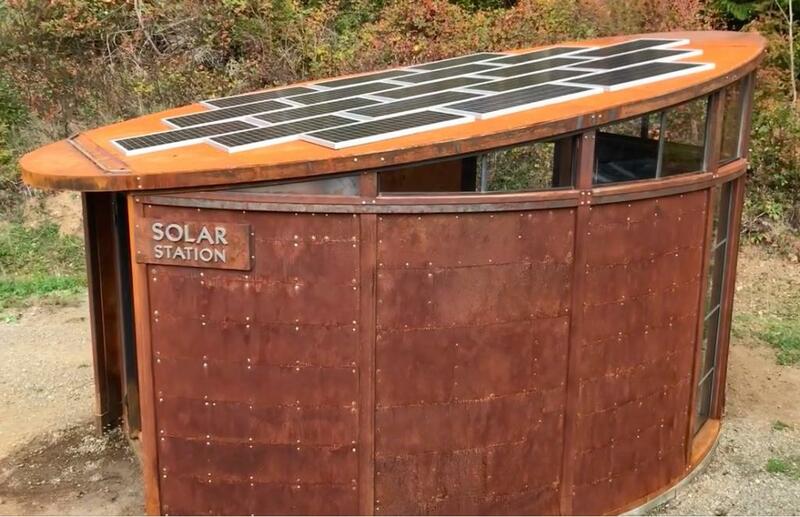 From the outside, this home looks like a typical tiny house on wheels, but inside there are so many great features which make it the perfect choice for those who want to live a sustainable off-grid life. They included propane appliances, a wood burning stove and a composting toilet. The home is built on a custom 24-foot double-axle trailer with a 14,000-pound capacity. The exterior is done in wood siding that has been painted a beautiful blue with wood trim accents and a metal roof. Inside, they continued with the wood panelling and this time painted it a lovely light grey to create some warmth without getting too dark. The flooring also has a slight grey tint to it, and all of the accessories have grey in them too. The ceiling above is also finished with wood tongue and groove panelling, but they left it natural with some stain and sealant on it for a dramatic effect. Also up at the ceiling, there is some beautiful fir beam work which makes the tiny house feel like a lodge. Plus, the skylights add so much to the home as well. More handcrafted work is included in the floor plan with the custom built staircase with storage in it. These come in so handy especially in a tiny house where every square inch must be used effectively. The kitchen features soft-closing cabinetry and a double sink which is rare to see in a tiny house design. The counters are all quartz which is an excellent choice for style and durability. In the bathroom, there is a full custom closet as well as a Precision Temp RV-550 NSP propane water heater. They also included a Separett composting toilet and a combination washer and dryer unit too. The entire unit can be solar powered with their optional solar panel and battery package. A home like this would make off-grid life pretty amazing, to say the least. 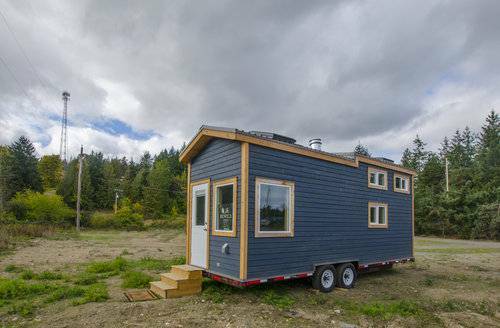 The Kestrel 24 foot tiny house on wheels from Rewild Tiny Homes makes small house living so comfortable. With this tiny house, there is no need to sacrifice style and comfort when downsizing. The Kestrel has so much to love about it including the incredible bathroom. The home is built on a custom trailer like each of their homes is which makes it easy to tow and move around. The design for this small home shows just how much storage space can be fit into a more modest floor plan too. Inside the house, there are custom floor to ceiling storage cabinets which would be great for clothing storage or a pantry. Then in the kitchen, there are more cabinets and drawers which is so essential for a small house kitchen. The builders also created a nice built-in bench seat in the living room area which is an excellent alternative to a sofa because it fits perfectly in the space. The kitchen also features butcher block countertops and a double sink with a built-in gas range for cooking. They also included a large fridge for food storage as well. Throughout the home, there are also some nice large awning windows which make for unobstructed views. There is also a skylight up in the sleeping loft which is great for allowing in more light and views. The flooring is all real solid hardwood, and they included fir trim and birch cabinetry. The staircase is also handcrafted out of wood, and it's full of even more storage with soft-closing doors and a washer and dryer combo unit to make laundry easier. The bathroom is the highlight of the entire home, and it features some gorgeous tile work surrounding a large bathtub. There are also two large windows around the bath for beautiful views while soaking in the tub or taking a shower. The tile floor compliments the bathroom, and there is a custom vanity and sink with a granite countertop. As usual, they added a composting toilet from Separett and an on-demand water heater. This certainly feels like an upscale condo on the go. A modern tiny house design with some natural details, The Fox Sparrow is a gorgeously sleek and stylish space with so much to love. This particular tiny house was designed for entertaining with some awesome opening casement windows and a live-edge countertop. Having this type of set up would be great for perfect for entertaining in the summertime. The home was built on a custom 24-foot long double-axle trailer with a capacity of 14,000 pounds. The exterior is clad in beautiful solid cedar wood siding from Vancouver Island which is close to where these tiny houses are built making it a sustainable option. They also used non-off gassing stains for their wood finishes to keep the home a healthy environment. Rewild Tiny Homes does offer off-grid possibilities, but this home has a 50 amp electrical service so it can be on the grid. The kitchen looks like the perfect place to cook up a meal for a few friends and features a 7.2 cubic foot stainless steel fridge and a 4-burner propane cooktop. The countertops are walnut wood, and the sink is a beautiful black granite sink with a farmhouse style faucet. Close to the kitchen is the bathroom with a sliding door with frosted windows allowing for more natural light. There is a nice vanity and sink in the bathroom along with a flush toilet and a large shower. They also have the option for a composting toilet depending on the needs of the individual. Other highlights of the home include a custom seating bench in the living room with storage and a custom staircase with storage in it as well. For heating, they have a Propane Dickenson heater, and there is also an external accessory propane BBQ tether. Up above, there is a large sleeping loft with hardwood flooring and a smaller loft that could serve as a storage space for the home. The shed roof and the skylight in the bedroom provides some more headroom in the loft and some more light which is always lovely. Plus, it would be pretty awesome to be able to star-gaze on a clear night. The Albatross features 3 bedrooms in its small floor plan plus a ton of other wonderful additions even a bathtub. The exterior of this tiny house on wheels is beautifully done with wood siding that has been stained a lovely medium grey. 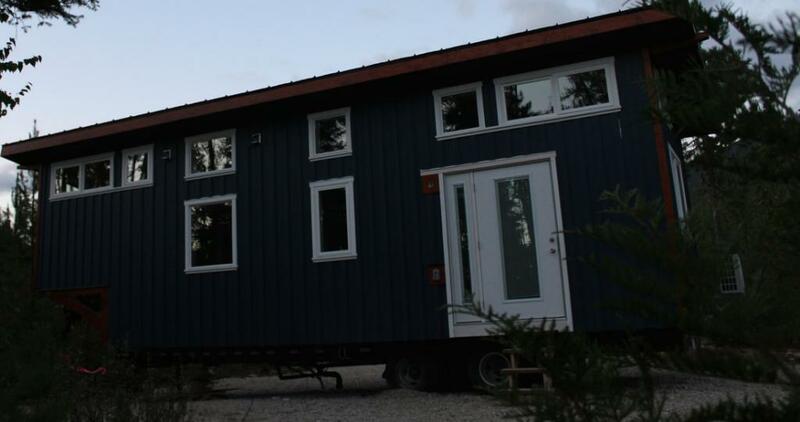 The tiny house is built on a triple-axel trailer which is equipped to handle the weight of the home itself plus the items and people living inside. This is a tiny house that could be appropriate for a family to live in, especially with the ground floor bedroom and a bathtub. Inside, the home is just as stylish with white painted tongue and groove panelling on the walls and the same on the ceiling. The kitchen has all of the necessary appliances including an oven and stove, microwave, fridge and even a dishwasher which is uncommon in tiny houses on wheels. The countertops are done in beautiful granite, and all of the cabinets are handcrafted with fir wood that was locally sourced. The galley style kitchen with the breakfast bar makes for the perfect place to sit and eat, and with the large pass-through window it would also be perfect for BBQs and gatherings out on the patio. The main floor bedroom includes a built-in wardrobe and a floating desk which would be great for a student or someone who works from home. There are also two loft bedrooms that are closed in with walls which give everyone some privacy and space. The lofts could also work as extra storage space too and are accessed by ladders with doors to enter in through. The home also has a split air A/C unit to keep it warm or cool depending on the weather. In the bathroom, there is a full-sized bathtub with tile surrounding it and Rewild Tiny Homes always gives their customers the option of either a composting toilet or a regular flush toilet depending on their needs. All houses can also be made fully off-grid with solar panels, batteries, propane appliances and more. This tiny house design is such an excellent example of a tiny house that a family could live in comfortably or a home that could suit a work from home situation comfortably. The Cypress tiny house is one of the tiny houses on wheels from Tumbleweed Tiny Houses, one of the pioneering companies of the tiny house movement. The company gives people the option of having their tiny house built for them from some of their most popular plans including the Cypress, Elm, Roanoke, and Farallon tiny house plans. They also give people the option of ordering a tiny house trailer that's ready to be built on. 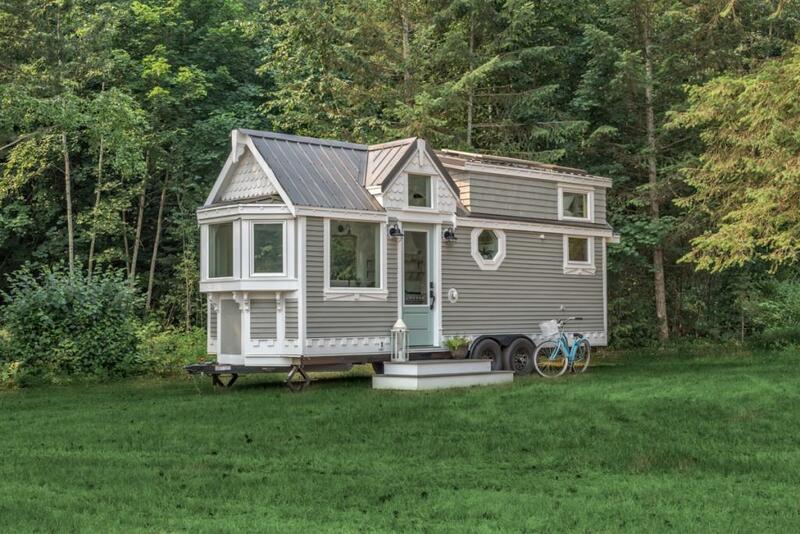 So people can build their own tiny house on a custom-built, high-quality trailer. Either option would be great, but when you get a complete build from the company, it will also be RVIA Certified which makes the tiny house easier to insure and sometimes easier to park in RV Parks. The Cypress model comes in three different sizes and floor plans even though the overall style of the home stays the same. The different options include the Equator which is a 26-foot option, the Horizon which is also a 26-foot option and the Overlook which is smaller at 20 feet. All of the models are the same width which is 8.6 feet and the same height which is 13.4 feet tall. The Equator will have 209 square feet on the main floor with 102 square feet in the loft space. The Horizon also has 209 square feet on the main floor but has 81 square feet in the loft. Then the Overlook has 159 square feet on the main floor with 73 square feet in the loft. The homes start at $62,950 to be fully finished and ready to move in and decorate. This will include all of the cabinetry and countertops with fixtures such as sinks and toilets. They will also include the appliances as well which you can see in the photos of the different models. Each home also has excellent storage features which allow for optimum storage space and flexibility in the use of the different areas of the home. Many of the homes also have built-in porches which is a nice touch so that you wouldn't have to build a porch each time you moved it. Have a look at all three plans and see which one you like best. The Roanoke is just one of four models of tiny houses on wheels available from Tumbleweed Tiny House Company. The Roanoke comes in three styles to include the Roanoke 20' Clear, the Roanoke 26' Pacific, and the Roanoke 26' Alta. The Roanoke 20' Clear is the smallest of the three with 190 square feet of space, the Roanoke 26' Pacific has 278 square feet of space, and the Roanoke 26' Alta has 315 square feet of space. Each Roanoke tiny house on wheels has a different layout. 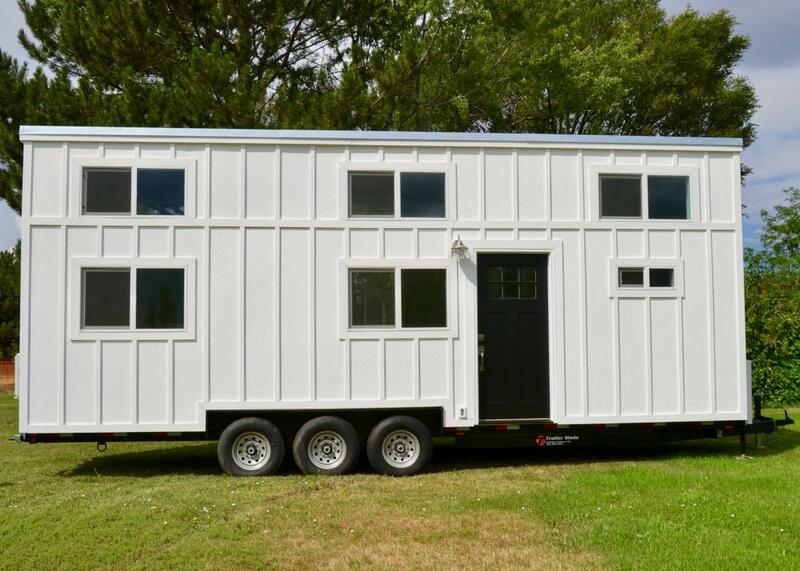 The Roanoke 20' Clear makes good use of space with 161 square feet on the main floor and a 29 square foot loft. This tiny house design opens to the great room/kitchen, with a queen sized bedroom area at one end of the design and a private bathroom at the other. Upstairs is a good sized storage loft. There is also a storage closet beside the kitchen. The Roanoke 26′ Pacific has 219 square feet of space on the main floor with a 59 square foot loft. The Roanoke 26' Pacific opens up to the great room with a 13'4" ceiling, next to that is the kitchen and the bathroom with bathtub at the end. Upstairs is a queen sized loft with stair access. The Roanoke Pacific has plenty of storage with storage in the great room, overhead shelving in the kitchen and bathroom, a storage closet on the main floor and storage in the queen sized bedroom. The Roanoke 26′ Alta has 219 square feet on the main floor with 96 square feet of loft. On the main floor, you walk into the great room, with a kitchen beside it, a bathroom, and a queen sized bedroom at the end. Upstairs there is a queen sized loft. The queen sized bedroom on the main floor is separated from the rest of the space by the bathroom, which offers extra privacy. There is lots of storage throughout with overhead shelving in the kitchen, a storage closet, cubby stairs and storage in the queen sized bedroom. The Roanoke Alta can sleep up to six if an optional second queen-sized loft is added. 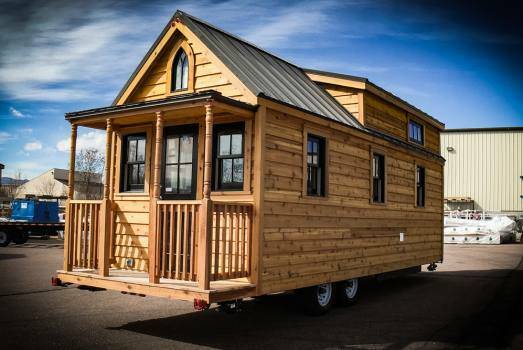 The Roanoke is just one of the four models of tiny house designs from Tumbleweed Tiny House Company. Tumbleweed offers a variety of tiny house designs with four models to choose from to include the Roanoke, Cypress, Farallon, and Elm each with unique features to best suit your budget, lifestyle and needs. For the creative and DIYers Tumbleweed Tiny House Company also offers DIY trailers that are designed specifically to carry your tiny house on wheels. Tumbleweed Tiny House Company is located in Colorado Springs, Colorado and offers delivery to the lower 48 states. For shipments of tiny houses on wheels outside of the continental United States, you will want to inquire within. The Farallon is just one of four tiny house models available from Tumbleweed. The Farallon comes in two designs to include the Farallon 26' Vista and the Farallon 26' Alta. The Farallon Vista has 284 square feet of space with 219 square feet on the main and 65 square feet in the upper loft. The Farallon Alta has 318 square feet of space with 219 on the main floor and 99 square feet in the upstairs loft. The Farallon Vista has superior craftsmanship throughout and makes efficient use of space for comfortable living. The front door opens into the great room, with a kitchen beside it, and a large bathroom at the end. Upstairs there is a spacious queen sized loft with stair access. The Farallon Vista has plenty of storage with shelves in the kitchen, a storage closet in the bathroom, cubby stairs that lead to the loft, and storage in the queen loft. The Farallon Alta opens into the great room, then the kitchen, bathroom and a queen sized bedroom at the back. Upstairs there is a queen sized loft and a smaller storage loft. The Farallon sleeps up to six if you choose to add the optional second queen-sized loft. The queen sized bedroom on the main floor is separated by the bathroom which adds a bit of extra privacy for owners. Whatever your small house living needs, the Farallon is a good choice. All of the tiny houses on wheels from Tumbleweed come with a standard set of features, with optional upgrades to choose. 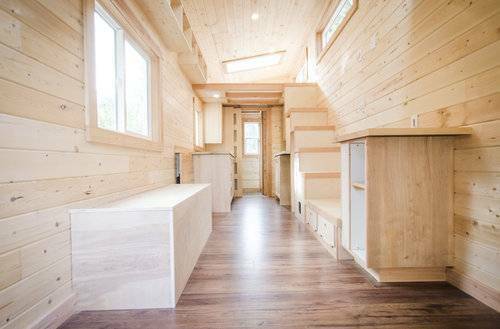 Included with each Farallon tiny house on wheels is a painted trim package, electric utilities to include water heater and cooking, pine tongue and groove walls, dark walnut floor (vinyl), maple butcher block countertop, white kitchen cabinets, brushed nickel cabinet hardware, white curtains and more. There are several optional upgrades available to include upgraded interior packages, electric and propane, gourmet kitchen and bath, air conditioning, washer and dryer and more. The Farallon is perfect for your small house living needs, whether that be for full-time living, vacation living, guest house, backyard office, or studio, the choice is yours to decide. The Farallon is just one of the Cypress Series of tiny house designs available from Tumbleweed Tiny House Company located in Colorado Springs, Colorado. They are the largest manufacturer of Tiny House RVs in North America, building tiny houses on wheels since 1999. 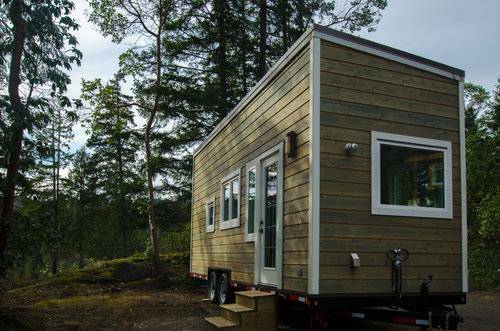 The Elm 26' Equator is a tiny house on wheels with 268 square feet of space, with two bedrooms and one bathroom. Whether you need a tiny house design for full-time living, vacation, or as a backyard studio, the Elm 26' Equator is a good place to start. This beautifully crafted tiny house design has quality craftsmanship inside and out. The Elm model of tiny house RVs is the original Tumbleweed design, created in 1999. The Elm features a custom arched window above the front door, in a design that has withstood the test of time. With a front covered porch that is charming right from the start, the Elm has plenty of details you will be sure to love. The main floor has 192 square feet of space, with 76 square feet in the upstairs loft. The main floor is an excellent design with a great room, kitchen, bathroom and a twin sized bedroom. The queen-sized loft has stair access, so no having to deal with ladders. The Elm 26'Equator makes efficient use of space with plenty of storage to include a closet, overhead shelves in the kitchen, a storage loft and storage in the queen-sized loft. It's easy to see why the Elm model of tiny house designs is still as popular today as when it first debuted. 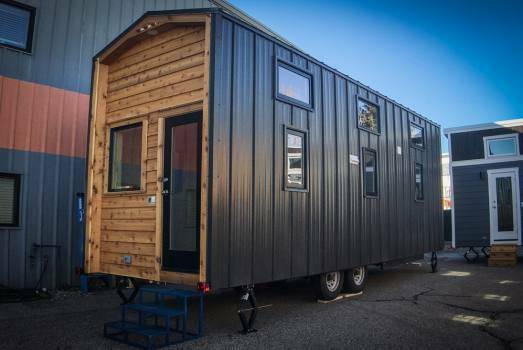 The Elm 26' Equator is just one of the tiny house on wheels available from Tumbleweed Tiny House Company, located in Colorado Springs, Colorado. Each Tumbleweed tiny house RV uses environmentally friendly, locally sourced, American-made parts and accessories. Tumbleweed Tiny House Company has ten Tiny House Hotel locations across the country so you can stay in one of their tiny house designs and experience small house living first hand. The Elm 26' Equator is just one of the tiny house design from the Cypress models with Tumbleweed Tiny House Company. Tumbleweed offers a variety of tiny house designs with four models to choose from to include the Cypress, Farallon, Elm, and Roanoke, each with unique features to best suit your budget, lifestyle and needs. For the creative and DIYers Tumbleweed Tiny House Company also offers DIY trailers that are designed specifically to carry your tiny house on wheels. 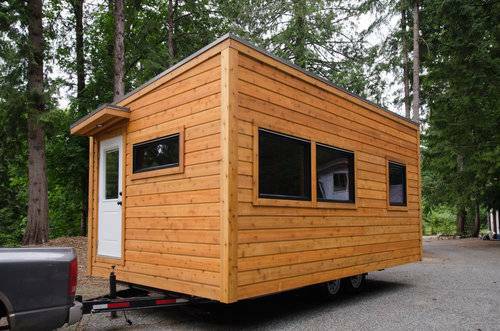 The Roanoke 26' Alta is a 245 square foot tiny house on wheels that sleeps up to six people. With 219 square feet on the main floor and 96 square feet in the upstairs queen-sized loft, there is plenty of space for comfortable small house living. You can sleep two in the queen-sized loft space, two in full sized bedroom and another two in an optional second loft. Without a second loft, you can also have a pullout couch in the living room for guests. The main floor has a great room and kitchen space, a bathroom and a full sized bedroom. The main floor bedroom in the Roanoke 26' Alta is separated from the rest of the space by the bathroom, which offers up some extra privacy. The queen-sized loft is accessed by stairs, so no having to deal with ladders in the middle of the night, there is also a smaller storage loft. The Roanoke 26' Alta makes good use of space with plenty of storage options throughout. There is a storage closet beside the great room, overhead shelves in the kitchen, a storage loft and storage in the queen sized bedroom. The Roanoke 26' Alta comes with the standard interior package to include pine tongue and groove walls, dark walnut floor (vinyl), maple butcher block countertop with white kitchen cabinets, brushed nickel cabinet hardware and white curtains. There are plenty of upgrades available to include air conditioning, farmhouse or cottage interior packages, gourmet kitchen, washer and dryer, skylight over the great room and skylight over the loft. The Roanoke 26' Alta is just one of the tiny houses on wheels available from Tumbleweed Tiny House Company. The Roanoke is one of the four tiny house RV models to choose from with Tumbleweed. 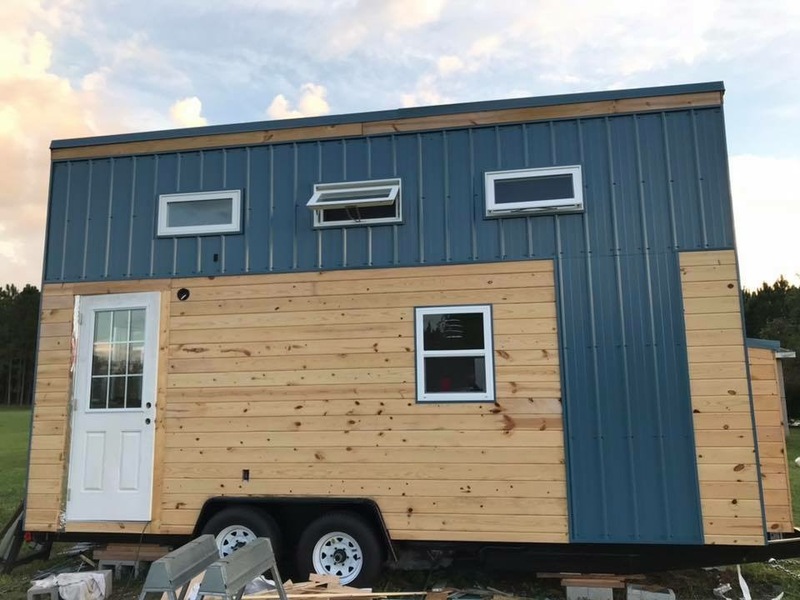 They also offer custom tiny house designs, and for the DIYer, there is a DIY trailer available which provides the perfect foundation for your tiny house on wheels. . Tumbleweed Tiny House Company is located in Colorado Springs, Colorado and offers delivery to the lower 48 states. For shipments of tiny houses on wheels outside of the continental United States, you will want to inquire within.